If you are a fan of Cowboy Caviar, then hang onto your seat because this easy dinner just might knock your socks off. 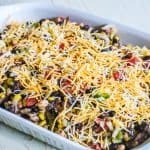 The dish was inspired by the flavors of the beloved appetizer and modifies the original Cowboy Caviar, to make it a perfect oven friendly baked dinner. 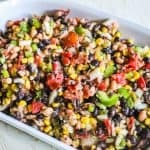 In case you have never had it, Cowboy Caviar is a dip made from beans, black eyed peas, corn, bell pepper and a few other ingredients, all marinated in an Italian dressing mixture. Traditionally you would use corn chips or Fritos to scoop up this hearty dip to eat. It is surprisingly delicious and addictive. What to do you get when you take all of those delicious Cowboy Caviar flavors and bake them over chicken? Cowboy Chicken is a meal in and of itself with the generous amount of toppings that smother the chicken. If you want a quick and easy truly one dish meal, you can have it with this recipe. If you are like me though, you always like to have an extra side or two to keep everyone in the family happy and let each person, customize their meal to a certain extent. Rice- I like plain jasmine, cilantro lime rice, or spanish rice best with this dish. Mashed Potatoes- Everything is good with these Instant Pot Mashed Potatoes! 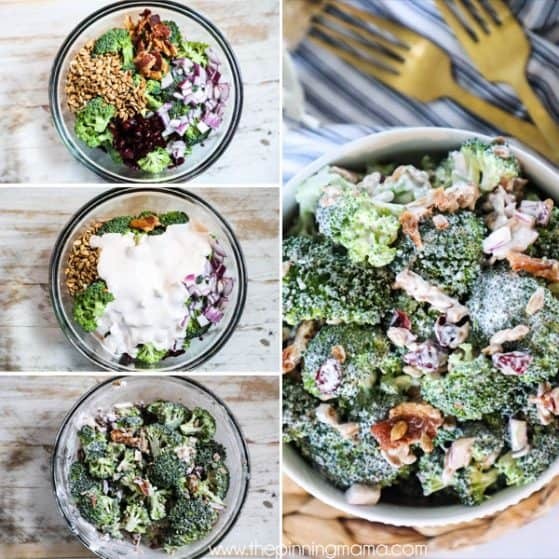 Salad- Maybe my favorite side for this dinner, a simple green salad perfect balances this chicken dinner. I especially like it served with Homemade Ranch or Homemade Italian dressing. You can pair it with one of these side ideas, or a few depending on how hungry you are, how much time you have and what your family likes. If you have other side dish ideas that pair well with this meal, let me know in the comments! Cowboy Chicken is super simple to make as promised. 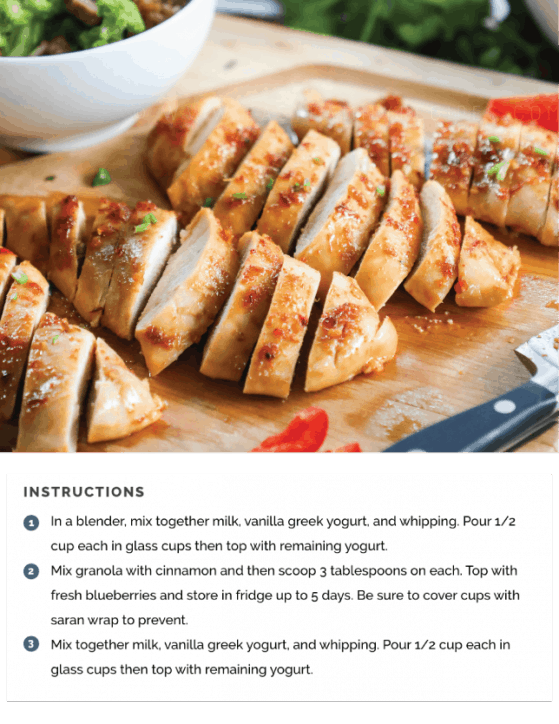 I am going to go over the steps here, as well as, give some some tips for making the recipe. 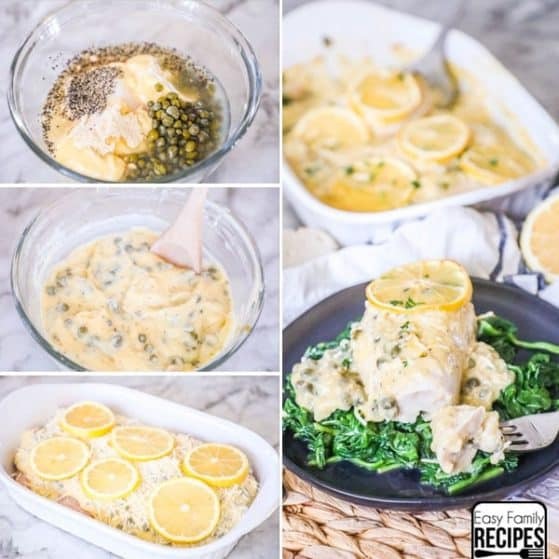 Make sure to find the full recipe card at the bottom of this post. First, find a nice large casserole dish. Cowboy Chicken is LOADED with toppings, so you need ample space for it all. Lay the chicken breasts flat in the dish so they are not overlapping. 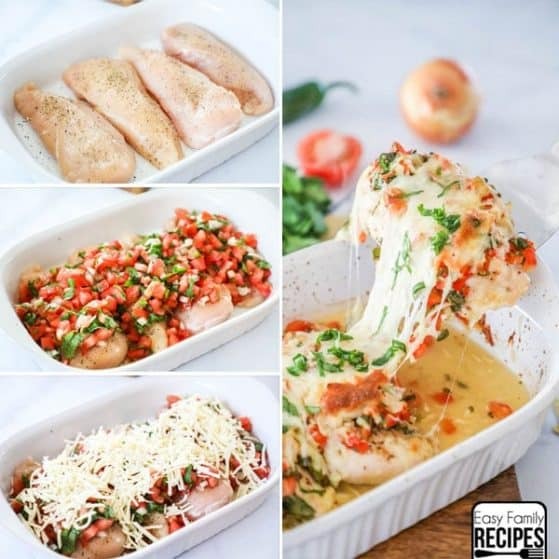 If your chicken breasts are regular to thick, you may consider cutting them so that they are half the thickness. This will help them cook more quickly and evenly and absorb more of the flavor. Sprinkle half of the Italian Dressing Mix evenly over the chicken. Make note that Italian Dressing Mix and Italian Seasoning are different. In this recipe we use Italian dressing mix. You can buy this at the store on the salad dressing aisle, or you can use my homemade version of Italian Dressing Mix. If you are gluten free I recommend you use the homemade version. It is quick and easy to make and can be kept on hand for up to a year to make this dish again and again! Next mix all of the beans and veggies together with the garlic, oil, remaining seasonings and lime juice. 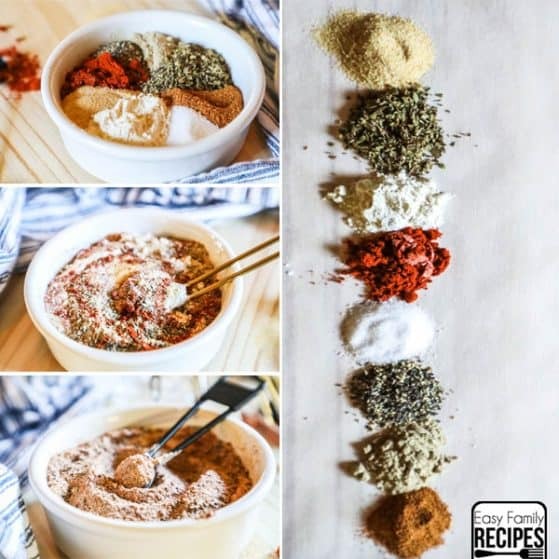 When you are doing this step, make sure that all of the canned toppings are drained as well as possible so that they don’t add additional liquid to the dish. Spread the mixture over the top of the chicken then bake uncovered at 375 for 45-50 minutes. Remove the chicken 5 minutes before the cooking has completed and sprinkle the cheese on to allow it to melt by the finished cook time. If you like your cheese crispier you can add it on earlier in baking. 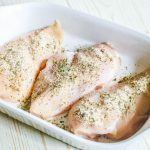 If you have leftovers of this chicken, they can be stored in the refrigerator to use throughout the week, or in the freezer to use throughout the month. Those leftovers are perfect for several delicious meals. With just a little effort, your family won’t even know you are eating the same dish! 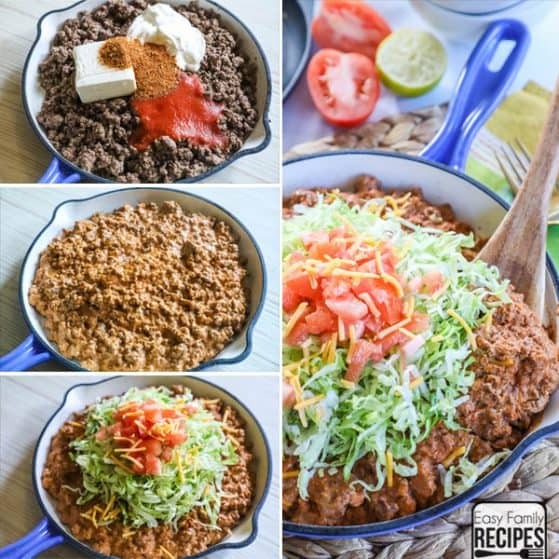 Cowboy Chicken Burritos– Chop leftover chicken and scoop it into a large tortilla spread with sour cream. Add a scoop of rice, and the topping from the chicken, additional cheese, and sliced avocado. Roll up and enjoy! 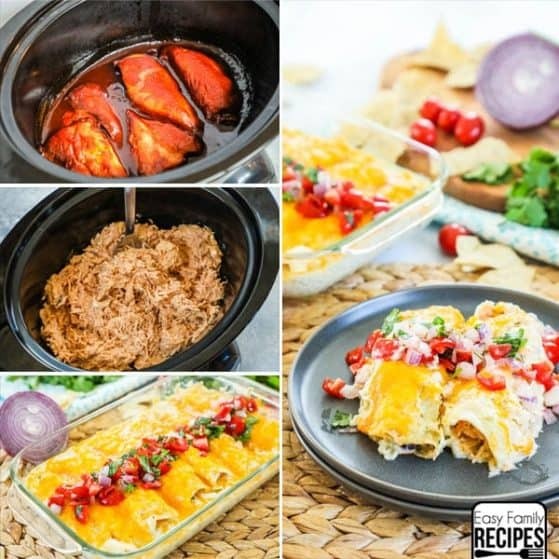 Cowboy Chicken Enchiladas– Shred leftover cowboy chicken and mix with remaining toppings. Scoop chicken mixture into a corn tortilla and roll it up and place in a baking dish. Repeat to fill. Pour red enchilada sauce over the top of the rolls and then top with cheese. Bake until heated through and cheese is melted. Cowboy Chicken Baked Potatoes– Split and fluff baked potatoes. Shred leftover Cowboy Chicken and mix with leftover toppings. Scoop a heaping spoonful on top of each potato, then cover with cheese and broil on low in the oven until cheese is melted and chicken is heated through. Top with a dollop of sour cream and diced green onions. 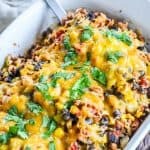 Cowboy Chicken Power Bowls– Chop Cowboy Chicken and mix with toppings. Fill bowls with prepared quinoa. Top with cowboy chicken, fresh guacamole, shredded lettuce, and a sprinkle of cheese. 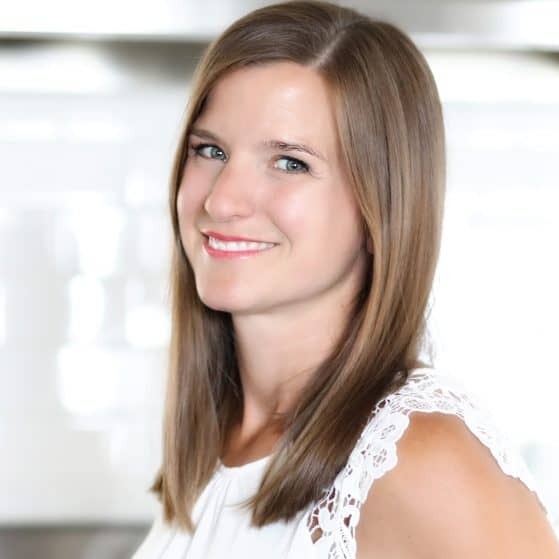 I always recommend you make the recipe as written, but if you have special dietary needs, or other questions, check out my FAQ’s here to help you get the most out of this recipe. 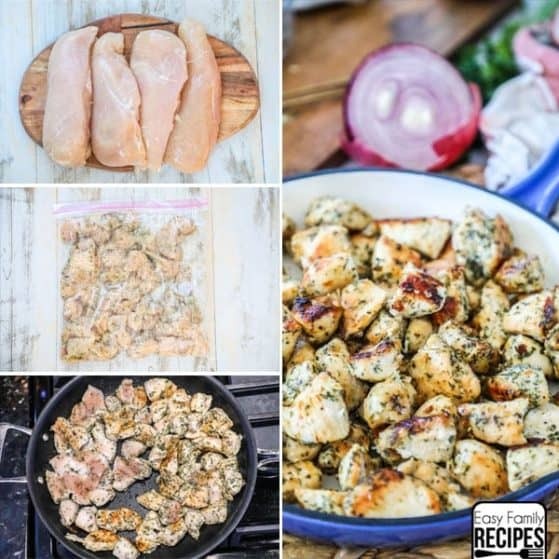 Can I use chicken thighs, chicken tenderloins, or other cut of chicken for this dish? Yes, as long as the chicken is boneless and skinless it should work well in this recipe. The cooking time will likely change based on the thickness and cut of the chicken though. All poultry should be cooked to an internal temperature of 165˚F to be safe to consume. Is this Cowboy Chicken Recipe spicy? This recipe does have a little kick. It will greatly depend on how spicy the jalapeños you select are since there is a range from brand to brand. If you don’t want the dish to be spicy, you can omit the jalapeños and still have great flavor without the risk of spice. 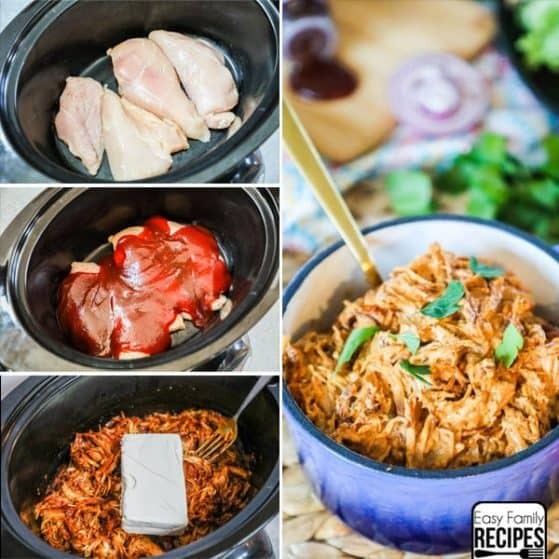 Can I make Cowboy Chicken in the Crockpot? Yes this dish will also work in the crock pot. I recommend adding all ingredients as directed, and adding the cheese 5 minutes before cooking is complete just as in the recipe below. You can make this in a crock pot by cooking the Cowboy Chicken for 2.5- 3 hours on high or 4 hours on low. 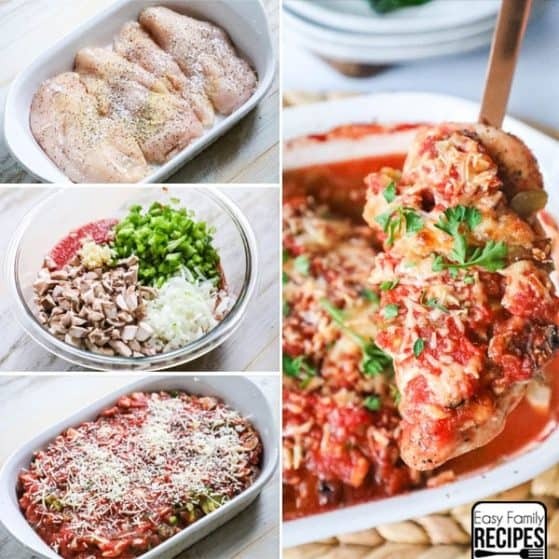 Do you have more EASY, one-dish chicken recipes? I really do hope that you get a chance to try this recipe soon and that your family enjoys it as much as mine does! 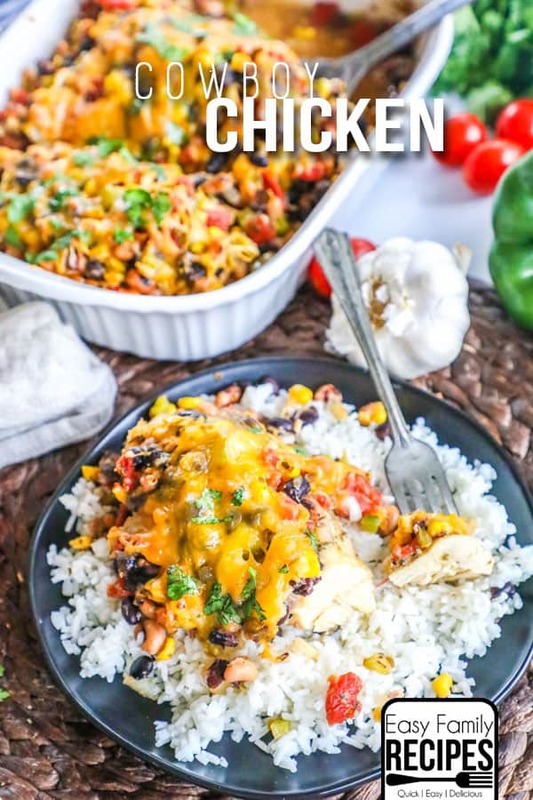 This Cowboy Chicken is packed with wholesome veggies, beans, corn, and loads of flavor! Top it off with delicious cheese and this one dish meal was made to please! Lay the chicken breast flat in a casserole dish, then sprinkle 1 tbsp of the italian dressing seasoning over the top. 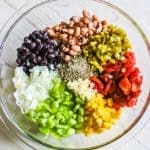 In a bowl, mix the black beans, black eyed peas, fire roasted tomatoes, corn, onion, bell pepper, garlic, oil, lime juice, and the remaining 1 tbsp dressing mix until combined. 5 minutes before the baking is finished, remove the dish and cover the top evenly with cheese and return to the oven to cook until done. Garnish with cilantro and serve over rice or with your favorite side dishes. Enjoy! 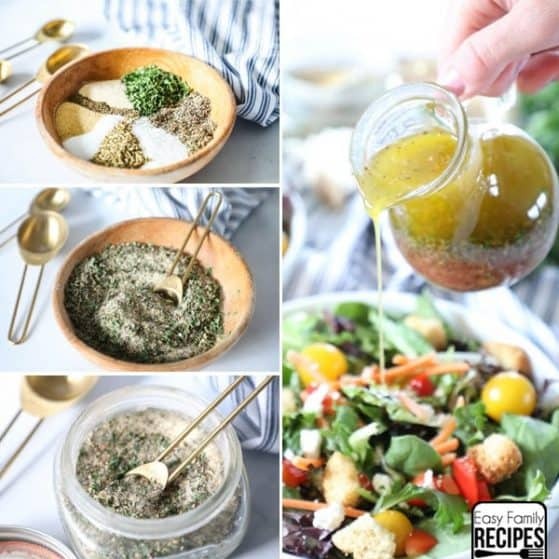 This recipe is naturally gluten free when using homemade Italian Dressing Mix. Please check all packages of products bought to ensure compliance. Another great casserole! We just moved and in the process of getting the other house on the market to we are busy! This was filling and great tasting. This is also going into rotation for busy weeks!